Maurizio Sarri finally addressed the issue that has plagued Chelsea this season – the lack of a prolific striker – with the loan signing of Juventus’ Gonzalo Higuain in January. The Argentine has hit the ground running, scoring his first goals in blue in a 5-0 win over relegation-battlers Huddersfield, showcasing his ability to find space in a congested box and then the net despite the angle being against him, as well as being a threat from distance. Sarri has had just Olivier Giroud and Alvaro Morata to choose from up front this season and has often preferred to deploy Eden Hazard as a false nine than go with the aforementioned duo. Hazard has expressed his dislike of playing up front in the past – he was used in such a role by Antonio Conte when the Italian was at the helm – and is surely relieved that Higuain’s arrival will see him shifted back out to his natural position on the wing. The two already look like striking up a dangerous partnership and linked up well against the Terriers despite it being only their second game together – this link up will only become more lethal as the season rolls on. 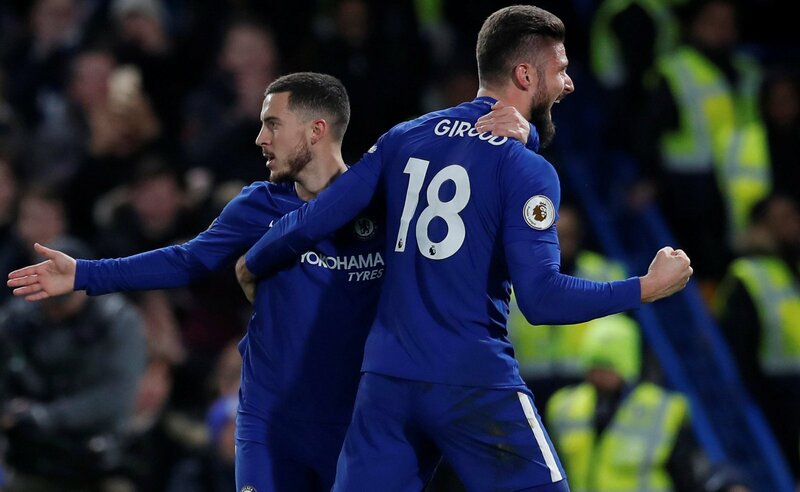 Hazard revels in his freedom to play off a big striker and has looked his best this season when Giroud has started – the big Frenchman might not be the most prolific goalscorer, but his hold up plays allow the Chelsea number 10 to make runs in behind and capitalise on knock downs. The former Arsenal man has found the net just once but has chalked up four assists in the league, all of which came within the first eight gameweeks. Hazard was the league top scorer in this period, scoring seven, and Giroud laid on two for the Belgian as he bagged a hat-trick against Cardiff. The number 10 described his big teammate as the world’s best target man, clearly indicating that he loves playing with that kind of player. While Higuain may not have 32-year-old Giroud’s stature, he is similarly less reluctant to make runs in behind and will drop deep to allow Hazard to make the killer runs, either to open up for a shot himself or to feed the magician through on goal. Having been criticised for his weight and size, the 31-year-old hitman’s perceived lack of mobility will be what makes him Hazard’s dream strike partner. The former Napoli man is far more clinical than Giroud and Morata, so Hazard will surely see his assist numbers sky-rocket, but his minimal yet brilliant movement will ensure we see plenty of quick one-twos and applause-worthy goals from the Belgian international, too. Mohamed Salah currently leads the way for the golden boot and Hazard has some catching up to do if he is to both prevent the Egyptian from grabbing the gong for a second consecutive season – currently being four goals behind – but if what we saw against Huddersfield is any indication of what’s to come, the former Lille man will be up there.